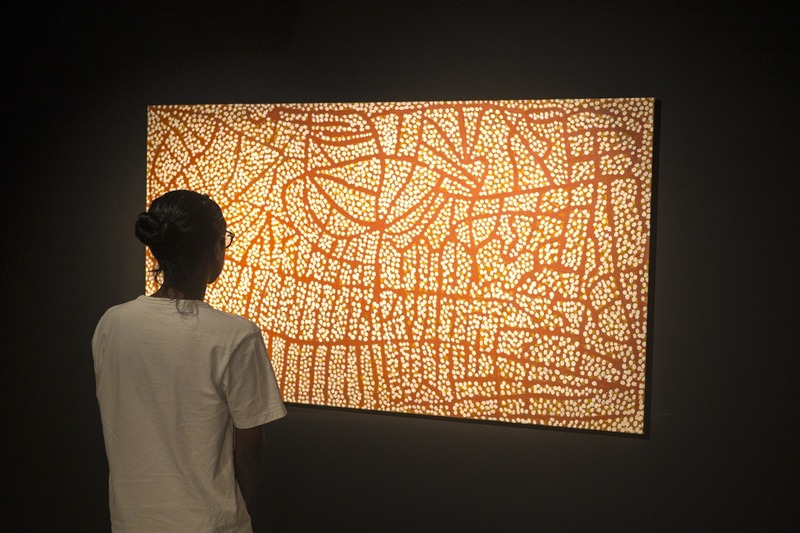 Yam Dreaming 1991 is a key artwork from the Campbelltown City Council permanent collection by internationally renowned artist and Anmatyerre woman, Emily Kame Kngwarreye. We are incredibly excited to announce that we are sharing this wonderful artwork with the world through the next Qantas-Balarinji ‘flying art series’. Campbelltown City Council purchased the artwork with assistance from the Australia Council in 1995. Yam Dreaming is a treasured work depicting the culturally significant yam plant which is a staple food source in in Kngwarreye’s home region. The artwork has been exhibited locally and internationally and is a wonderfully vibrant and lively work. Campbelltown Arts Centre is excited to be able to assist launch this wonderful work into the skies to honour Aboriginal and Torres Strait Islander Australians, and Emily. The Emily Kame Kngwarreye 787 Dreamliner has been launched in Seattle and will make its way directly to Alice Springs where it will be welcomed in ceremony by the artist’s family on 2 March.